Fashion : Transitional Items for your wardrobe. I’ll be honest with you, this summer I haven’t really shopped much. 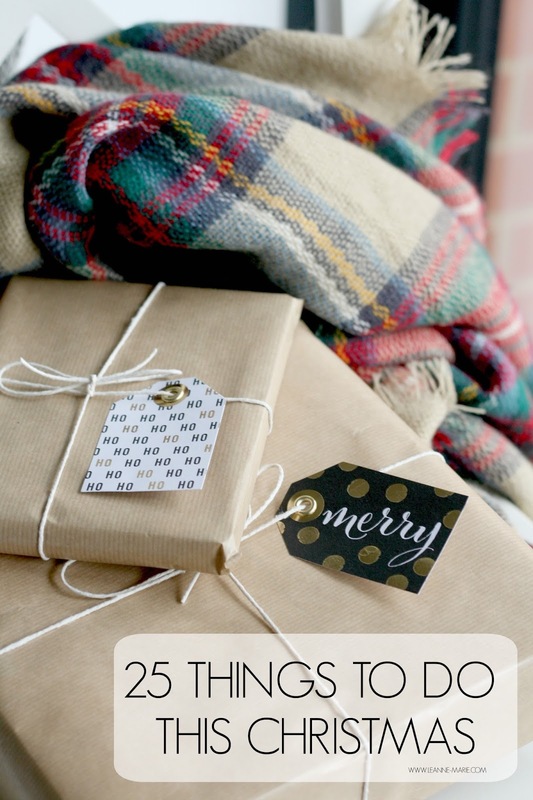 As I’m currently going through a bit of a decluttering phase as well as trying to streamline my wardrobe, I’ve not found myself pursuing any particular trends this year. However I do have a holiday coming up at the start of September, so that itch to go out and purchase a few pieces to throw into my suitcase is niggling away at the back of my mind. When I shop for clothes these days I look at it from an entirely different angle. No longer do I impulse buy because I saw *insert bloggers name here* wearing it and I need it in my wardrobe stat, or simply think ‘Oh that dress would be good for this birthday meal out’ Nowadays I look at things in the long run. Am I be able to mix that dress with different pieces so I can wear it for work? Will it work well as something in the Autumn as well as this summer? Maybe even wearable in the even colder months? It’s all about picking those items that see you through the current season and beyond. While on the hunt for a few holiday bits I came across these gems that I wanted to share with you. Maxi dresses are an ideal choice for the summer months, when you need something that’s light, cool and breezy. These are must in everyone’s holiday suitcase. Don’t go thinking that maxi's are just for the warmer months though. After spotting blogger babes Katy and Kim sporting their maxis with ankle boots & jumpers last autumn, it's inspired me to keep the maxi trend going. They are a item that you can wear all year around. I would personally go for block colour dresses over prints in order to make them wearable from January to December. While doing my online food shop last night I noticed George at ASDA’s maxi dresses for their variety of styles and great value, you could also wait till the very end of summer to try and nab some real bargains. Another staple in everyone’s wardrobe... You just can’t go wrong with a good pair of Skinnies. My current favourite have to be the Leigh Jeans from Topshop. The only jean that fit me well in the leg (Thank you petite range) and around the waist comfortably. These are great for a cool summer day, with a pair of sandals and a cami top, but will also look great with a simple jumper & jacket as the cooler weather sets in. Floral dresses are always featured heavily in stores during the warmer months. An ultimate summer holiday/festival must have! I already have a few dresses in my wardrobe which make an appearance all year around. Wearing them with tights and leather jacket in the winter is a bit like a uniform for me. So easy to put together and throw on! Shift dresses are also a piece that is starting to feature heavily in my wardrobe. They are so easy to wear to work during these warmer times with a pair of sandals, keeping me cool but still look like I’ve made a little bit of an effort. Just like the floral dresses I would pair these with a heavier jacket, tights and boots when it gets a bit colder. What items do you have in your wardrobe that help you with the transition from Summer to Autumn? When it comes to the summer, there 5 items that you will ALWAYS find in my handbag. People always love a good ‘What’s in my handbag’ post so I thought I’d put together a similar post, sharing with you the 5 essential items that I make sure I have with me on a day to day basis during the summer months. Obviously we all need a pair of sunnies in our bag! I usually just opt for the cheapy ones from Primark. However Firmoo contacted me and asked if I would like to try some of their shades. As they offer ones with prescription lenses I jumped at the chance – always nice to still be able to see when you are protecting your eyes from the sun! I opted for frames that also come in standard glasses form, I just chose to have the lenses tinted to make them sunglasses! They have a funky pattern on the inside of the arms, which makes them a little different. I went for a sort of wayfarer style as I knew that suited me well. The ordering process was nice and simple and delivery time was very quick. 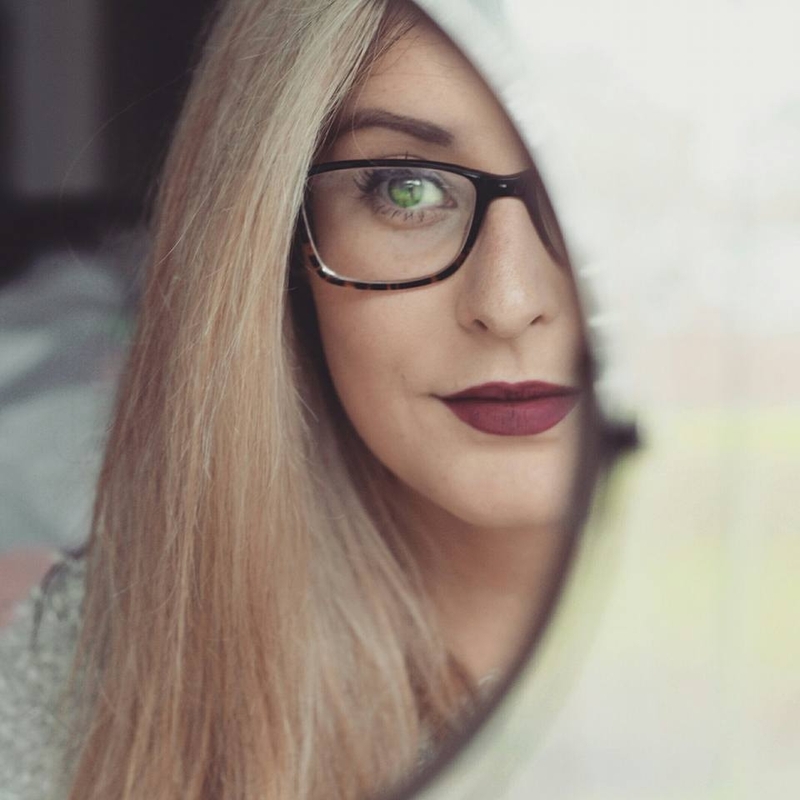 If you choose prescription lenses over standard it does take 1 or 2 days longer, but if it meant I would be able to see while wearing them that didn’t bother me! I tend to switch up the beauty products in my handbag quite often, but one that stays firmly put during the summer months is a translucent powder. I’m not an oily gal, but when the sun is out I do get the odd bit of shine. There’s dewy skin and then theres… ugh shiny! I was very loyal to RimmelStay Matte for a while, then switched it up a bit and bought the Soap &Glory pressed powder. I do prefer the packaging to this one, as the lid stays attached and it comes with a nice mirror inside! I don’t tend to use the powder puff that comes with it though, opting for a bareminerals face brush instead! Not very glamourous I know, but I HAVE to have some form of plaster in my bag. Warmer months = New shoes. New Shoes = Rubbing and possible blisters. So you need to be prepared. Thankfully I haven’t had to dig out any plasters for my feet as of yet. My New Look teens flip flops are doing me well – Little tip if you have size 5 or below feet, check out the teen range of shoes.. a hell of a lot cheaper! God bless having size 3 feet! 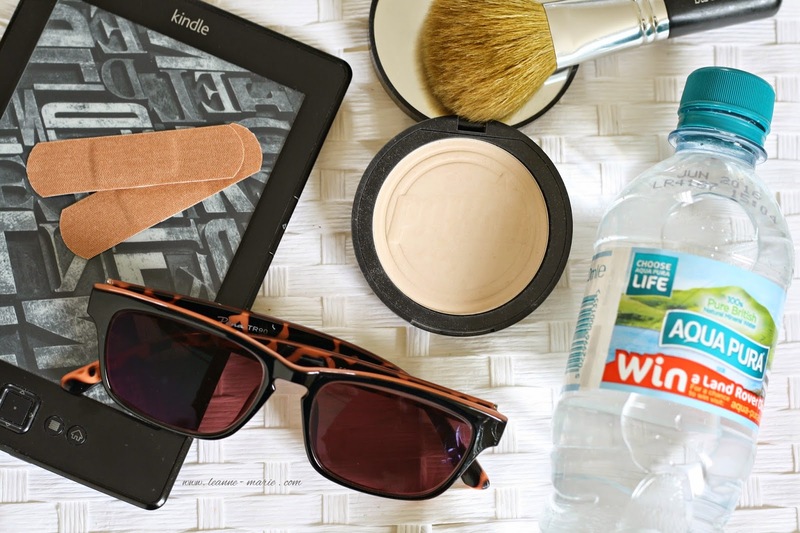 I currently just have standard plasters in my bag, however for that extra bit of comfort, or if the injury is particularly bad I often have a little box of compeed blister patches in there! I’ve recently got into the habit of drinking a lot of water – which is a good thing obviously as it helps your skin along with other health benefits. So much so that I now make sure that I ALWAYS have a bottle in my handbag. It’s really important to stay hydrated throughout the day, especially when it’s really hot outside. I’m no water snob, I either get it out of the tap at home or grab whatever is the cheapest in the shop! Whether it be a kindle, an ipad, your phone or even a good old fashioned paperback book. I find it’s always a good idea to have something in your bag that can keep you entertained! There have been times when I just want a little me time, and potter off along to the canal near to wear I live. Kindle in hand along with my other essentials, find myself a sunny spot to sit down in and just read and read. There have been times when I’ve been in town with some friends and we’ve just set up camp in the local park, just chilling out, playing some summer tunes from our phones. It’s really nice just to take those moment either by yourself or with friends and chill in the summer sun! What are your summer handbag essentials? I’d love to know what you carry around with you. Let me know in the comments. Beauty: Cooling Mists for Summer. With the weather getting increasingly hotter, and many of us heading overseas for our summer holiday now is a good time to make sure you have a few essentials in your beauty cupboard to ensure you keep cool. Cooling mists are a must have one everyones shopping list if you are going on holiday..or are planning to get yourself out there and enjoy the sunshine we are having in the UK at the moment. There are a wide variety of sprays available on the market. Today I am going to share with you the ones I have in my stash. First up, we have the Peppermint Cooling foot spray from The Body Shop, if you are someone that suffers with hot feet this is a must! Obviously by using any form of spray or mist, it is going to be a quick fix, however spritzing a pump or too of this minty goodness on my toes after walking a long distance or while sunbathing on the beach is such a nice relief. The fine mist instantly cools and refreshes, leaving a slight minty fragrance behind – those of you that aren’t a massive mint fan, the scent doesn't linger too long. For £6 you can get a 100ml bottle, which I feel is good value for money, it’s definitely a must have for your beach bag when you go away! 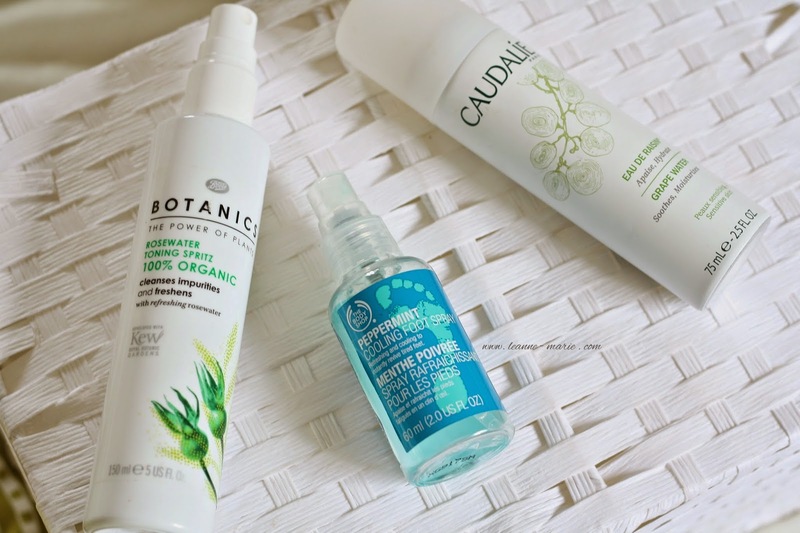 Facial mists have become fairly popular in the beauty world over the past year or so. I’m sure many of you can hold your hands up & admit you purchased a bottle of the Caudalie Beauty Elixr? I never did because I wasn’t a fan of the scent. I do however have their other offering which is the Caudalie Grape Water which came in a set that I was gifted by the lovely Charli. This is a great mist to have in your handbag for those warmer days, a light spritz all over your face and it instantly cools you down. I wouldn’t say this has a very strong scent but there is a little something there. If you wanted to go for something that was completely hypoallergenic then I would suggest something along the lines of the Eau Thermal Avene water spray or La Roche Posay thermal Spring water spray. An added bonus to having these mists on hands, is that they double up as pain relief if you are suffering from sunburnt skin. Finally, a little extra product I found in the depths of my beauty stash. The Botanics Organic Rosewater toning spritz is something I bought on a whim when boots have had their 3 for 2 offers on, I don’t really use it as a toning spray like suggested, but it works very well as a refreshing mist when it’s a bit warmer. It’s at lower end price wise out of all the mists I have mentioned so far which is a bonus. Sometimes a product label can say it’s to be used a certain way, but it’s nice to break the rules if it’s suitable! So this is one to look out for if you’re looking for something new to try. What will you be using to keep yourself cool this summer? am at work) next the sky is full of ugly looking grey clouds and there’s not a ray in sight. Sort it out UK, It’s meant to be the summer! Due to the lack of opportunities to sunbathe so far this year (don’t worry I will makeup for it on my Holiday in September) I have been reaching for the bottle in order to get a bronzed glow. There are a couple of different tanning products I would like to share with you. As mentioned in my June favourites post, I have been enjoying the Vita Liberata self tan – which since that post went live, it has had a bit of press coverage because apparently it’s the tan Kim K likes to use! So there you go! There are a range of different types available from the brand & even though the one I have is the fast developing one I like to use it overnight for hint of 'I've just been on holiday' tan. If you want a hint of colour & don't have much time to spare you could try the Laurens Way Rapid Tan* which comes in both mousse and spray form. You only need to leave it to develop for 60 minutes and you are left with a light sunkissed glow. It does dry fairly quickly on application so you will need to work fast to ensure you don't miss any spots! I would say if you are someone who likes a really dark tan, this fast developing tan may not be for you. It gives a nice glow - You'll be asked if you've been out in the sun for sure however, for something a bit deeper I would opt for Laurens Way Glam Tan. The colour payoff is a bit better. Another option if you are in a rush & don’t really want to alter your routine would be to try a moisturiser with tan in it. You can just moisturise as normal after showering and then over a few days build up to a lovely tan. My current favourite has to be the Palmers Cocoa Butter naturalbronze, which doesn't have that horrible biscuit scent that other tanners have. After one application I look sunkissed & I don’t need to re apply for maybe 2 days – I stick to a regular moisturiser between then. At less than £6 it’s the cheapest of the bunch, it won’t take long to save your boots points to get a bottle. 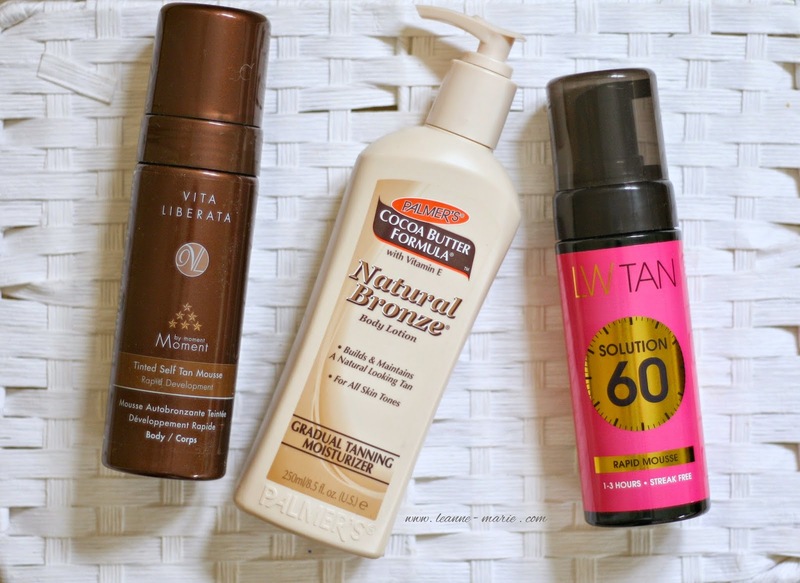 So what tanning products have you been reaching for this summer? Or maybe you're one of the lucky ones and have a real tan?! Here we have the newest addition to my eye shadow collection. The Bare Minerals duo in 'Top Shelf'*, my new go to shadow from day to day. Top shelf consists of two eyeshadows; Mixologist & Cognac both extremely beautiful shades alone, but together they make a great pairing. 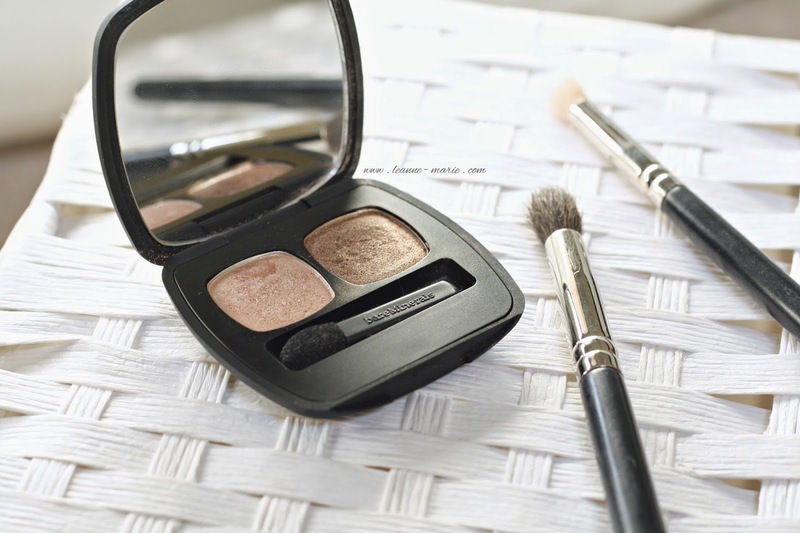 This pressed eyeshadow duo from Bare Minerals is a must have for neutral lovers out there. A Duo I always swatched when visiting my friend at her counter, the shadows are so smooth in consistency & are a absolute dream to apply, you have no problems using a fluffy brush to blend these shades out. Mixology, the lighter of the two shades is a peach toned shimmer that works extremely well on the inner corners as well as all over the lid. It really makes your eyes appear wide awake and brighter - which is a godsend when you stay up late watching OITNB each night! Cognac is the more pigmented of the two. I remember when discussing this duo with Robyn previously she informed me that I would need the tiniest amount on my brush to use on the outer V of my eyes and she wasn't wrong. This is one pigmented shade! Cognac is a bronze brown with a lot of shimmer running through, it looks great paired with Mixology but would work equally as well with a lighter matte shade all over the lid. In terms of wear, I don't need to use a primer with these shadows which is a huge bonus. There's nothing worse than applying vivid shades only to find out after 8.5 hours at work plus a 45 min walk home that your eyes look a mess.... this is not the case when I wear this duo on my lids. My eyes look exactly the same as when I leave the house at 7:30 in the morning! Such a bonus, its once reason why this duo has shot right up to the top of my most reached for products list in the past few weeks. 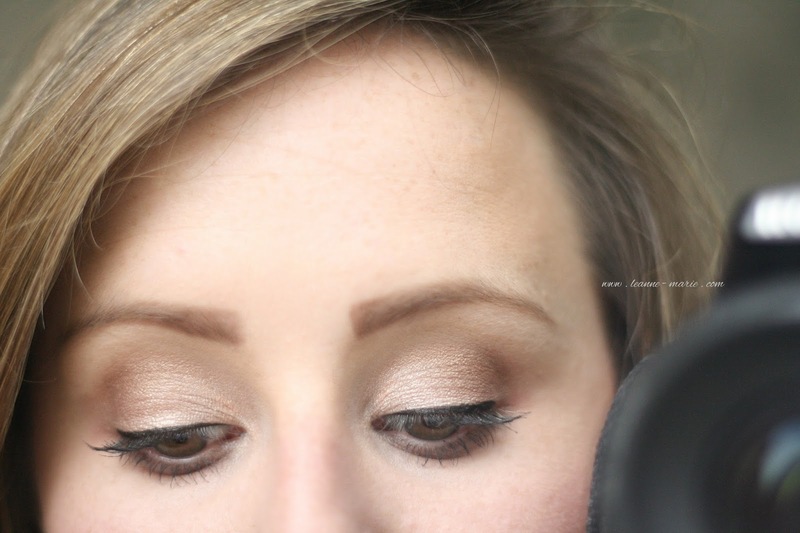 I've only played around with bare minerals shadows once before in this post, but considering how impressed I am with this offering I may have to investigate further to find some gems from the brand! This particular palette was from Chemist Direct, which offers a lot of brands at a slightly discounted price which is always a bonus. You can buy Top Shelf for £14.99 rather than £19.50. Have you tried anything from Bare Minerals before?